The chill of a winter morning couldn’t subside the blazing excitement of Anglo-American University’s Open House event on January 20. Students from as far as Moldova and Israel traveled to Prague for an opportunity to talk directly with AAU’s students, and academic and administrative staff about the university. The Open House event started at ten in the morning with a heart-warming welcome to all attendants. AAU greeted not only Czech high school students, but also Vietnamese, Italians, Israeli and Americans, bringing a vibrant multi-cultural background to the event. After everyone’s self-introduction, students and staff felt more connected through common interests. Most people were fans of traveling. They loved learning about different cultures and meeting new people. This made AAU the perfect place to spend their college years at. Suchomel also emphasized the significance of AAU’s dual accreditation. Since the university received accreditation from the Western Association of Schools and Colleges (WASC) in June 2016, AAU degrees are accredited not only by the Czech Ministry of Education, ensuring their validity in the EU, but by the US Department of Education. Anglo-American University is one of a few universities globally to have received this prestigious accreditation. This makes the process of transferring credits much simpler. It also means that AAU diplomas are now recognized in the USA. In addition, during their studies, Anglo-American University provides its students with opportunities to go on exchange programs, volunteering, internships, and to work abroad. Iveta Morávková, AAU Student Life and Career Center Specialist, took the stage to discuss the exciting student life at AAU. Anglo-American University has a variety of active clubs, Student Ambassadors, a student-run magazine Lennon Wall and a Student Council, holding annual grand events, such as Student Council Elections, Spirit Week and an Annual Ball. In addition to the vibrant activities, students are also provided with academic and employment-seeking assistance. The Academic Tutoring Center helps students with academic writing. The Career Center guides students through the process of finding jobs and internships that suit their abilities, fields of study and interests. 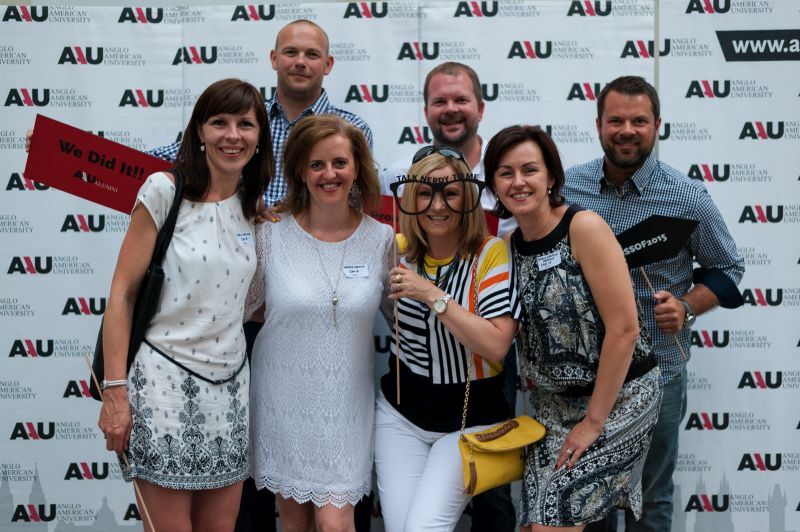 AAU keeps in close touch with its Alumni Community. AAU’s alumni are willing to meet with students, discuss post-graduation prospects, or establish business networks. After some main guidelines about AAU’s admissions process, students went on a tour around the campus. The exclusive tour around the Thurn und Taxis Palace, dating back to the 17th century, left a deep impression on the students. They were amazed by the campus’s architecture, the detailed ornamentations on the walls and ceilings, and ultimately, those gorgeous chandeliers in almost every classroom. “This is bombastic,” said one of the students, not able to hold in his amazement. The tour continued through the Computer Lab and then passed the splendid adjacent historical buildings to the Library. 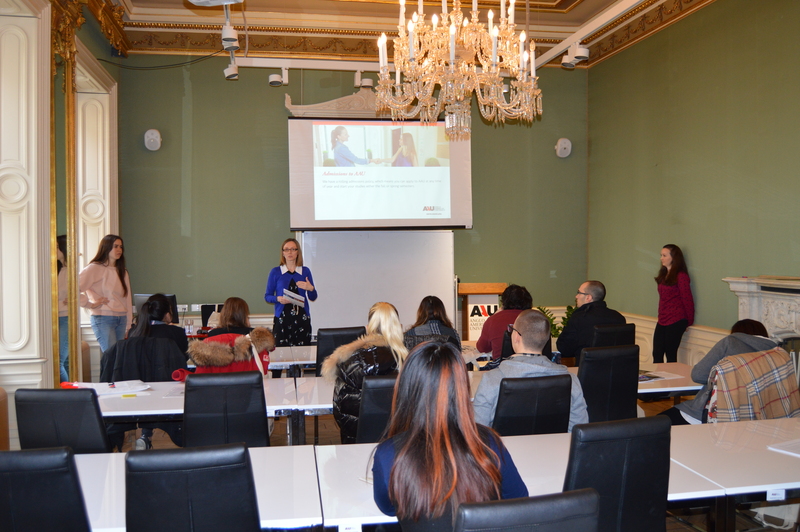 Afterwards, the students went back to the main building to have an in-depth talk about the study programs with representatives of AAU’s Schools of Study. There will be another chance for aspiring students to visit AAU for a tour and explore the campus’s beauty along with its high-quality education. AAU’s next Open House events will be held on March 24 and June 16. The capacity is limited, so one would need to register in time by sending an email to admissions@aauni.edu.